Over time we got a variety of three casting cost versions… Foul-Tongue Invocation, Tribute to Hunger, and Oath of Liliana are all three casting cost upgrades to the Edict model (whether instant or sorcery speed). All of them offered a little something extra — whether life gain or more card advantage — in exchange for a third mana. Vona’s Hunger can line up almost unprecedented card advantage provided you have the city’s blessing. This instant has a cool new keyword. If you control ten or more permanents, you get something called “the city’s blessing” for the rest of the game. 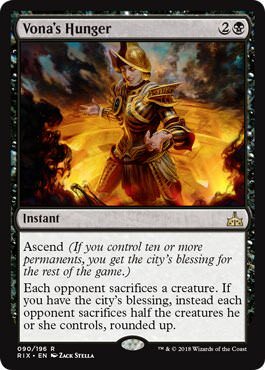 Presumably, you can have ten permanents the first time… But if you go below ten permanents upon casting a second Vona’s Hunger, you’ll still have the city’s blessing. When would Vona’s Hunger like the city’s blessing? It isn’t difficult to imagine a time you might want Vona’s Hunger on three. For example, any time the opponent is trucking in with a lone Bristling Hydra, you might want a removal card that can kill it no matter how big, no matter how hexproof. Any time the opponent is protecting a key threat — say an Electrostatic Pummeler – with Blossoming Defense backup, Vona’s Hunger might be the card you want. We haven’t seen tokens in a while, but the Anointed Procession decks are probably the most consistent at producing 10+ permanents. It’s difficult to evaluate the “big” version of this card. 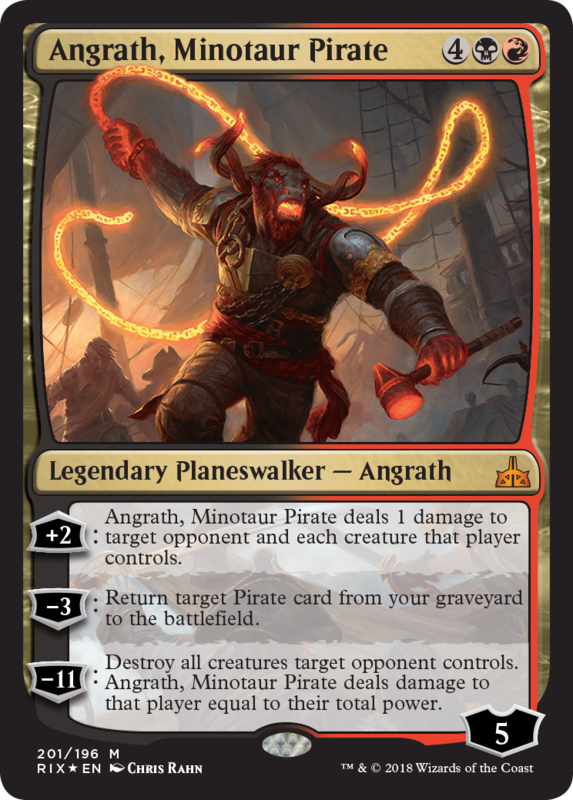 It’s kind of half a Wrath of God, but also asymmetrical (meaning it does not kill any of your creatures… Just half of the other guy’s). You know when tokens might really, really want Vona’s Hunger? … But there could have been. 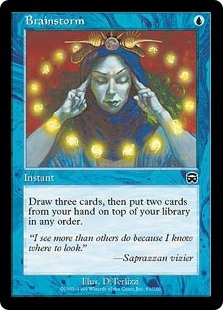 Modern is a great format! It’s waaaaay different from other formats, though. One way we know that is that we have such a hard time predicting what will be good from one week to the next. 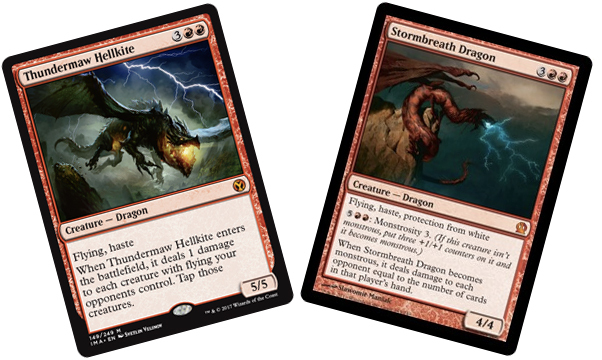 … and when you say “Jeskai” what exactly do you mean? 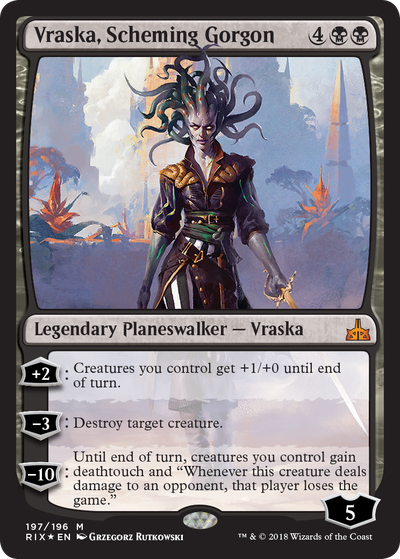 Is it Geist of Saint Traft, Spell Queller decks, the new Search for Azcanta stuff… Or are you talking about warping in an Emrakul, the Aeons Torn? Who is to say you’re not up against Thundermaw Hellkite this week? I mean, it just so happens that this week the right answer was “giant green things” (whether Primeval Titan or Tron-based colorless bombs), but we think you take our meaning. A few weeks ago we started talking about the new / now-seminal Humans deck based on a critical mass of Unclaimed Territories. But what if, rather than pushing “Human” with our Cavern of Souls, we just play four copies of Sliver Hive? These decks barely scratch the surface of this week’s Modern Rundown. Get ready for multiple Tron styles, double-combo Collected Company decks, and our intrepid duo completely ruining a perfectly wonderful Orzhov Zombies deck. Angrath’s FuryMike compares it to Primal Command.